XI guarantee to aid in financing the construction of two product tankers. A shipbuilder for the project has not been determined as yet. The 37,500-dwt vessels will be powered by slow-speed diesel en- gines, and capable of operating at 15 knots. They are intended to be used in the domestic trade between U.S. Gulf and East Coast ports. The actual cost of the two ves- sels is approximately $119.8 mil- lion. If approved, the Title XI guarantee would cover 87y2 per- cent of that amount. VP Of Colmac Coil Mfg. Millan, president of Colmac In- dustries, Inc.
Colmac Industries and is a major manufacturer of heating and re- frigeration coils. He has over 30 years' experience in refrigeration and coils, and has owned two contracting firms do- ing refrigeration installations. Coil, Mr. Dever will not only man- age the Colville plant, but will also be in charge of outside sales. Exxon International Company has awarded the contract to de- velop and install the maintenance system and to inventory the on- board spares in the four ultra large crude carriers (ULCCs) of the Esso Atlantic/Tokyo class. Two of these tankers are approxi- mately 500,000 dwt and two are 400,000 dwt. Exxon has decided to proceed with this class after a year of evaluation of the Stan- wick maintenance system on four 37,000-dwt tankers of the Everett class. Stanwick Company project man- ager, maintenance engineering analysts from Stanwick's Mari- time Systems Department, work- ing in coordination with Exxon's maintenance and repair staff, will establish a comprehensive pro- gram of scheduled maintenance tasks for all maintainable ship- board equipment, and produce the management system for schedul- ing and auditing the accomplish- ment of the program. Stanwick will also inventory all shipboard repair parts to provide input data for a computerized inventory con- trol program. Stanwick's maintenance and in- ventory control systems are in- stalled in more than 50 other commercial ships and drill rigs around the world. For further information, con- tact Jerry Clark, Marketing Man- ager, The Stanwick Company, 3661 East Virginia Beach Boule- vard, Norfolk, Va. 23502. You don t just buy a radar, you buy a reputation. When one of the world's foremost marine electronics companies adds a new radar to their line, you can expect something really special. 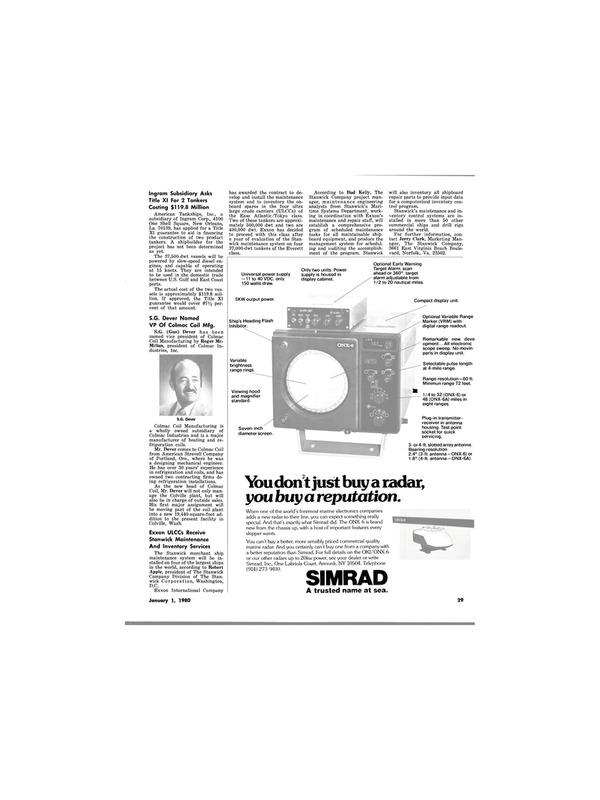 And that's exactly what Simrad did. The ONX-6 is brand new from the chassis up, with a host of important features every skipper wants. A trusted name at sea. Universal power supply -11 to 40 VDC, only 150 watts draw. 5KW output power. Only two units. Power supply is housed in display cabinet. Target Alarm, scan ahead or 360°, target alarm adjustable from 1 /2 to 20 nautical miles. Marker (VRM) with digital range readout. Remarkable new deve opment...AII electronic scope sweep. No moving parts in display unit. Selectable pulse length at 4-mile range. Viewing hood and magnifier standard. Minimun range 72 feet. ft 1/4 to 32 (ONX-6) or 48 (ONX-6A) miles in eight ranges. Plug-in transmitter- receiver in antenna housing. Test point socket for quick servicing. 3- or 4-ft. slotted array antenna. Bearing resolution 2.4° (3-ft. antenna-ONX-6) or 1.8° (4-ft. antenna-ONX-6A).